Every so often, I force myself to wade through the huge pile of recipes I have collected, recipes I mean to try. Usually they are from the half dozen food and cooking magazines I receive every month. Today’s sorting turned up one for a savory mushroom bread pudding that I had earmarked for cold weather. Unfortunately, I tore it from an unknown, untitled publication so I can’t properly credit its author. Buy the freshest mushrooms you can find. If you decided to use Portobellos, as I did, remove the black gills under their caps, as they can add a bitter taste and unappealing color to many dishes. My mushroom man at the local Farmers Market was on an extended Thanksgiving break, so I went to Whole Foods and picked out Portobellos for their meaty taste, and a handful of Criminis. TIP: Place the baking dish on a sheet pan to prevent oven spillage. 2. Melt 1 tablespoon of the butter in a large skillet over medium-high heat. Add the onion and cook until limp, about 5 minutes. Add the garlic and thyme and cook for another minute. Now add the madiera and cook until most of it has been absorbed by the onion mixture. This will take another 5 minutes. 3. Add the sliced mushrooms and the olive oil. Season with salt and/or pepper to taste and cook until the mushrooms release and then absorb much of their liquid. This will take about 10 minutes. Turn off the heat and add the parsley. 4. In a medium-sized bowl, beat the eggs and add the milk. Stir well, season with additional salt and/or pepper. Combine the grated cheeses and set aside. 5. Butter a 9-inch square glass or ceramic baking dish. 6. Spread half the bread slices over the bottom of the dish. Cut the pieces so as to completely and evenly cover the surface. Next, add the mushroom-onion mixture. Cover with half of the combined grated cheese. Layer the rest of the bread slices on top. 7. Pour the egg custard over the pudding, pushing the bread down with your hands so that it absorbs the custard. Top with remaining grated cheese. Drizzle with truffle oil, if desired. 8. Cover the dish with foil and bake for 20 minutes. Remove foil and bake, uncovered, for another 20 minutes until pudding is puffed and browned. Allow to rest 10 minutes before cutting and serving. This sounds like a wonderful side dish with a roast! So comforting and sounds delicious! All of those flavors are great together. The dish looks delicious, too. I have to try this recipe very soon. Hope you’re feeling better! I just made mushroom souffle’s for a lunch tomorrow…we must be on the same wave length today! Nice photo…have you acquired another camera yet? Welcome home, Mary – nope, same point and shoot camera. Your soufflé sounds good. What a perfect dish for a blustery day like we’re having in SF today! I wish I had some right here, right now! I have a pile of recipes to go through that I want to try, and the pile seems to grow overnight, so I totally understand! Love the photos too, Liz. Really beautiful! This recipe is perfect for my favorite wimpy vegetarian 😉 Thanks for liking it too. I hope you try it – the truffle oil really adds a nice touch if you have some on hand. I use it on pizza too. Mushrooms are a favorite ingredients in my house. I’ve bookmarked this recipe to try. Thanks – let me know how it works for you if you try it? Larry actually pulled that piece of wood out of a dumpster for me. What a scrumptious sounding recipe and your photos are lovely! I’ll definitely be making this for my family. I know what you mean about the piles of recipes…my “to try” folder gets thicker and thicker despite sorting and pulling ones out to make. All good, though! Thanks, Hannah, enjoy the recipe. I was pleased that Larry ate it and thought the mushrooms “meat-y” enough for an entrée. I love mushrooms! Alas husband does not! This is a recipe I will store for one of those days when Im cooking just for me! 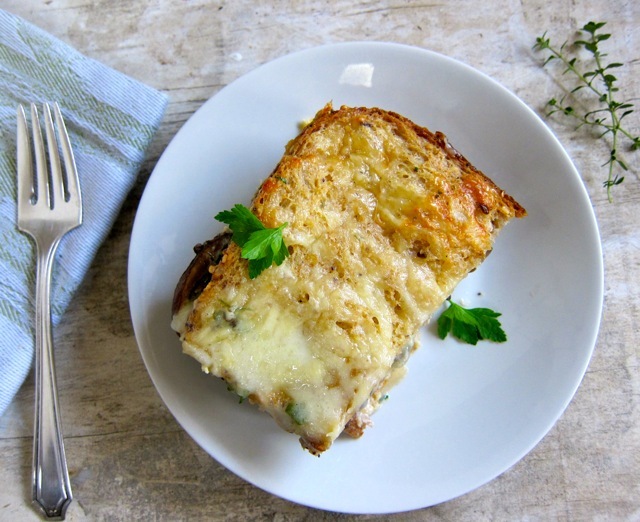 I adore mushrooms of all shapes and sizes and love the idea of a savory bread pudding. I’ve never made one before (though I guess turkey day dressing comes close), but welcome the idea as an alternative to rice or potatoes as a side dish. Thanks, Steve – it would be fun to play with all sorts of mushrooms mixtures here.